Ok, guys! 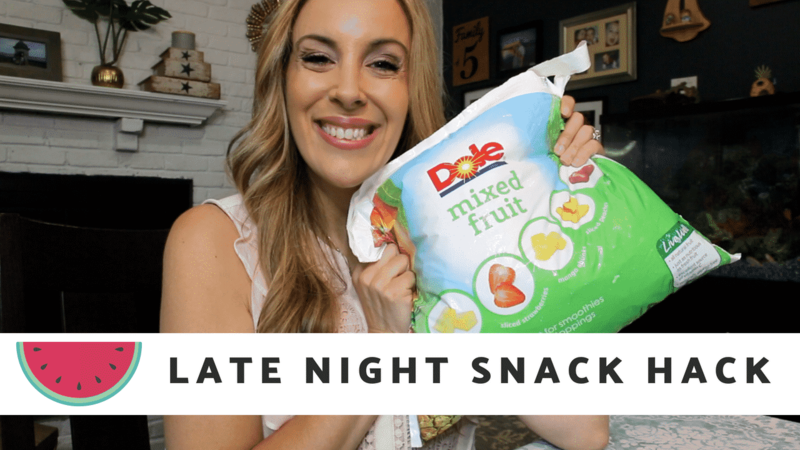 I love to snack at night – this is a TRUTH I cannot deny. But I don’t always make the best decisions when I am curled up on my bed while watching a movie. In fact, during those times, I tend to opt for the chewy, warm, and gooey. Am I the only one? I don’t think so!! Well, last week, I was craving something yummy and headed straight for the kitchen but found that I had NO baked goods readily available. In a panic, I opened up my freezer and decided to pour myself a mug of Dole Frozen Mixed Fruit. Friends… this has become my new favorite quick healthy snack hack. I can’t stop eating it! My kids are now eating it. It’s all I talk about with people who come over! YOU HAVE TO LISTEN TO ME. I’m about to change everything. Do you ever eat something and then regret it? Instantaneously? That happens to me… always. Like literally always. I think that I want that delicious piece of cheesecake. I devour said cheesecake without noticing that I am even eating it. Then, once I realize that I don’t have any food left to eat, I discover that I never actually enjoyed a single bite and come to the conclusion that the entire experience was both a waste of time and calories. Mindless eating. Regret. Hate. Repeat. Mindless eating. Regret. Hate. Repeat. I am someone who wants to be better at making the right choices but just cannot get there… yet. I am trying though. I give myself that. I believe that I am a work in progress and I am thankful for it. This quick healthy snack hack that I stumbled upon is really helping me at least get through dessert every night. I feel good about the decision I make when that sweet tooth starts to yearn for some lovin’. In fact, this HUGE bag of Dole frozen fruit – which I picked up at BJ’s for like $8 or something like that – is still FEEDING US. 6 POUNDS OF FRUIT OHMYGODWHATISHAPPENING. Check out the video to hear more about my quick healthy snack hack! I am telling you – it is a step in the right direction! !